Swiss International Air Lines will begin operating a second daily Zurich-Chicago O’Hare round-trip at the end of May and will introduce a six-times-weekly second service between Zurich and San Francisco from July 5. As of April 29, Virgin America will operate four round-trips each day from Dallas Love Field to each of the three destinations. 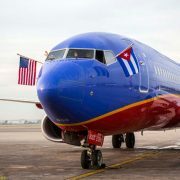 Southwest Airlines is launching non-stop service from Dallas Love Field to San Francisco International Airport and Oakland International Airport on January 6, 2015.